Raymarine's optional video accessory cable connects directly to the video accessory port of select e-Series MFDs and provides a second NTSC/PAL compatible video input, suitable for a marine camera, entertainment source or satellite TV system. 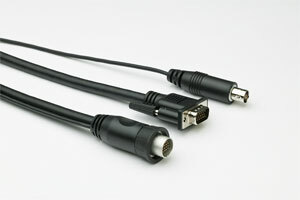 Additionally, the cable provides a VGA output which can be connected to Raymarine monitors or most flat-panel TVs and computer monitors. This lets you see the output from your connected MFD at a second location on your boat.